Mix cream cheese with electric mixer until fluffy. Add the crushed Oreos and beat on high until well mixed. Chilled for at least 2 hours in freezer. 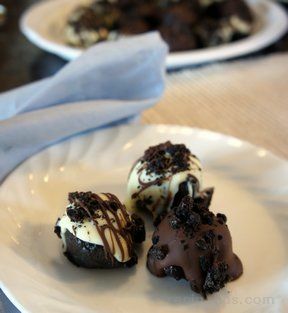 Then roll Oreo cookie mix into one inch Oreo Balls. Next, melt the chocolate chips and shortening in a double boiler or in the microwave. 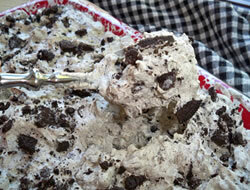 Dip the Oreo balls completely into the melted chocolate using tongs or a toothpick. Put on wax paper. 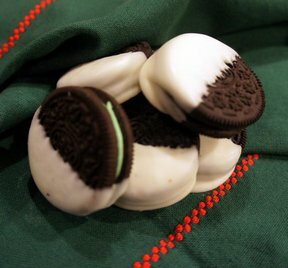 After the Oreo balls harden, keep them in the refrigerator. Makes about 3 or 4 dozen Oreo Balls, depending on size.